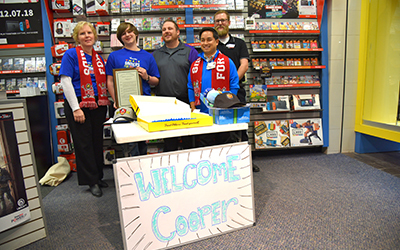 Cooper Davis was surprised about his trip to Orlando earlier this month at an Indianapolis GameStop location. To shine a light on the importance of children’s hospitals and how donations help kids get the best care when they need it, Riley Children’s Foundation is pleased to participate in the third annual #ChildrensHospitalsWeek from March 18-24. Riley Hospital for Children is one of 170 member Children’s Miracle Network Hospitals (CMN Hospitals) across North America and the only CMN Hospitals partner in Indiana. As a part of #ChildrensHospitalsWeek celebrations, we introduce you to Cooper Davis from Greenwood, Ind. 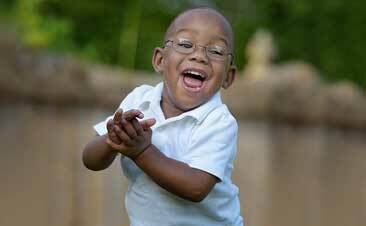 Cooper has been named the 2019 Children’s Miracle Network Hospitals Indiana Champion. After being diagnosed with a high-risk type of leukemia, he received treatment at Riley Hospital for two years and today is cancer free! We checked in with Cooper about this new ambassador role. Q: Tell us about yourself – what do you like to do? A: I’m 15 and a freshman in high school. I love to play guitar and perform with the worship team at my church. I also like to play video games and hang out with my friends and my older brother. Q: How has Riley made it possible for you to pursue your interests and dreams? A: I have gotten to enjoy a lot of opportunities that I would not have been given without Riley! I’ve attended some really fun events and met some great people. The staff at Riley Hospital has made it possible for me to pursue my biggest dream of becoming a police officer. I worried I wouldn’t get that opportunity. But because of Riley researchers, doctors and nurses and their treatment for my cancer, I will now be able to pursue that dream. Q: Tell us about your involvement with Extra Life. Why is it important to you to give back to Riley Hospital? A: Riley Hospital has done so much for me and for many others. Extra Life is a great way to give back and raise money for sick kids! Not to mention you really have fun while doing it and you get to meet a lot of awesome people. I’m happy to be able to give back. Q: You will be traveling to Orlando soon for #ChildrensHospitalsWeek! What are you most looking forward to about your trip? A: I haven’t been to Disney for about 10 years so I’m excited to get go back. I was recently cleared by my doctor to ride roller coasters again so that’s pretty awesome! I’m also really excited to check out the Extra Life tournament and see the turnout at the convention. Click here to learn more about #ChildrensHospitalsWeek.